International band TANGENT PLANE has been formed by composer and keyboardist Ralph Swan Krieger. Having played gigs with the likes of FATES WARNING, MIND ODYSSEY and SIEGES EVEN, the band was discovered in 2007. Their debut, “Among Grey Masks” was released in 2008, and the fixed line up was; Ralph, Jan Michaelis, vocals, Piero Pellegrino, guitars, Kostas, bass, and Dennis Hoffman, drums. C. Schmid and R.D. Liapakis have produced this first part in a trilogy about Project Elimi. The sound is excellent from the first keyboard note on. “One Month in Real-Time” opens in an eighties synthesizer style, but Piero´s guitar work is well-placed in the mix. The major force behind the DEPECHE MODE touch is probably Jan´s voice. TANGENT PLANE actually has a unique sound, for better or worse. They try new paths in”One with the Lies” too, which is characterized by Jan´s voice and Dennis´s drumming. Jan range is from the odd to the synth pop influenced, somewhere betwixt vibrato and depression. This is a very progressive band with a solid rhythm section and pleasant guitar work, but the voice works like a power switch. You probably love it or hate it. They have an interesting mix between heavy and light parts, gentle keyboard patterns meet a thrashing guitar. They opt for the highly special vocals in “Ice Age”, which may work with some progressive parties, but leaves Jan sounding like an elderly woman at times. The outstanding arrangement in “Borrow Me Your Dullness” makes me re-think. Fortunately Jan sings unstrained, and at once the pieces seem to fall in the right places. The voice is noticeable in “Do You Live”, but the speedy track is still compelling enough. 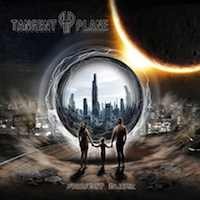 TANGENT PLANE seems to be faltering at times, they can be slightly theatrical, variety reminiscent, thrashing, odd, and that is quite a lot in one record. It took three songs before “Borrow Me Your Dullness” saved them, and the vocals were quite hard to muster in the first three songs. The most consistent songs are “Borrow Me Your Dullness” and the title track. With all this in mind I can only say that there is a fine line between genius and madness. This is an album for the brave!